The shape of the selected area can be rectangular, polygonal, circular or elliptical, depending on the area to be edited. This flexibility further facilitates the clear display and editing of noise in the periodic domain. Effective use of FFT is reliant on understanding the periodic display and correctly interpreting the data. A repeating pattern consisting of diagonal lines is seen in [Figure 1]a. The lines are of uniform width, spacing, direction, and gray value. 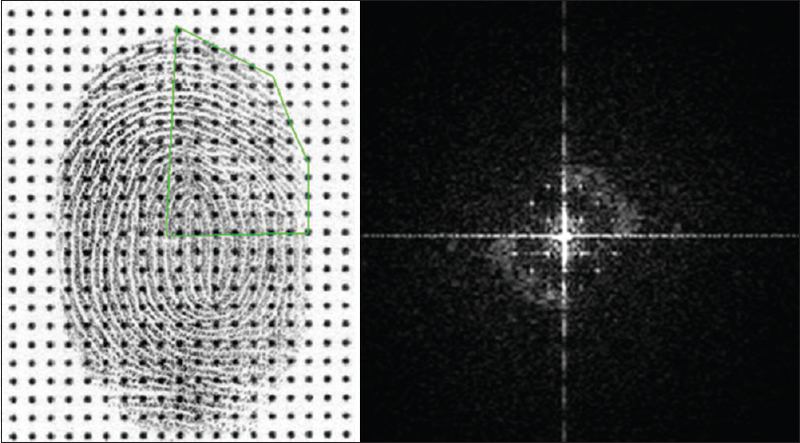 When this image is converted to the periodic domain, the resulting signature is quickly seen – a line of focused white spikes along an axis that is at 90 degrees to the direction of lines in the original image and passing through the dynamic center of the display [Figure 1]b. This signature is a mirror image and consequently, editing done on the one side of the center line will automatically be applied to the other. A mechanical dot pattern is depicted in [Figure 2]a. The pattern elements are relatively uniform in size, direction, frequency, and tonal value. 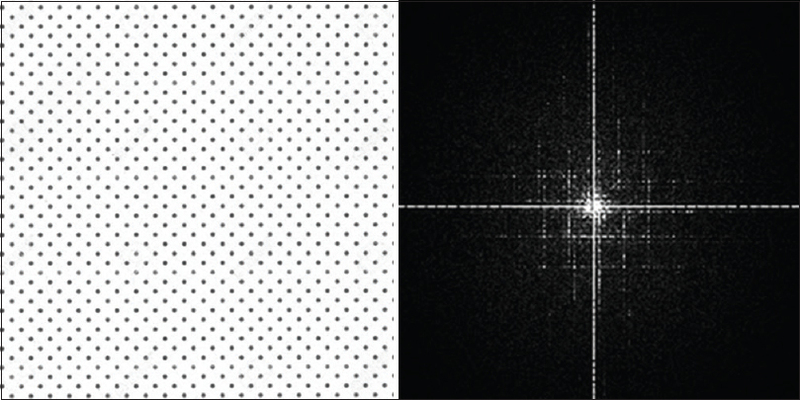 When the image is converted to the frequency domain, the data pertaining to the pattern are manifested as focused white spikes against a black matrix [Figure 2]b. These spikes are the pattern data. When a fingerprint is placed in black ink on the dot pattern [Figure 3]a, it displays a separate signature in the frequency domain [Figure 3]b, in stark contrast to the uniformity of the dot pattern. This signature is donut-shaped, consistent with the changing direction of the ridges through 360 degrees. It is also seen as a soft haze of spikes, reflecting the variability of ridge detail in width and frequency, as the imprint of an organic entity rather than a mechanical pattern, the elements (dots) of which are repeated without significant variation. In [Figure 4]a, the upper-right sector of the fingerprint is delineated and converted to the periodic domain. The soft arcing signature of the ridges in that quadrant is clear [Figure 4]b and is left intact. The spikes associated with the dot pattern are removed [Figure 5]a. 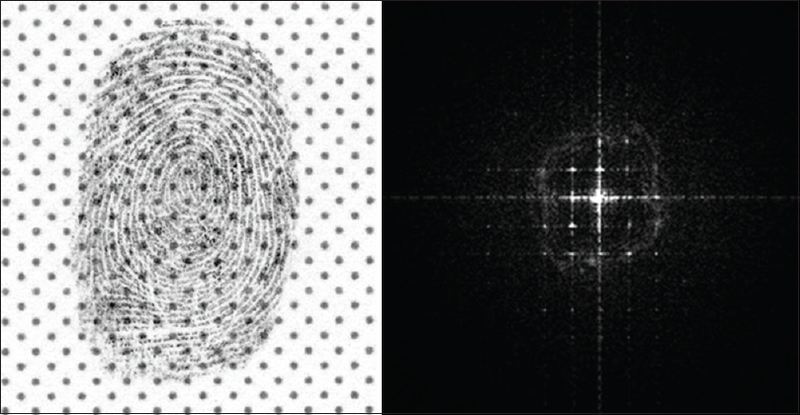 When the edited periodic display is converted back to the spatial domain [Figure 5]b, the dot pattern has been considerably diminished, and the ridge detail of the fingerprint remains clear. [Figure 6] displays the final result when the signature spikes pertaining to the dot pattern in all four quadrants of the image have been edited. 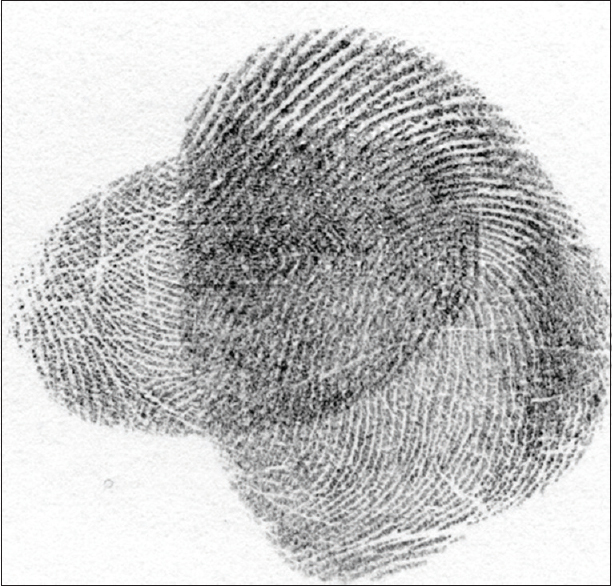 A fingerprint was deposited in black ink on a textured plastic fabric [Figure 7]a, which has obstructed the ridge detail, limiting the analysis, comparison, and evaluation of the impression. The impression was transformed, quadrant by quadrant and edited, in the same manner as for Example 2. [Figure 7]b displays the effect of the editing. Occasionally, fingermarks developed on evidence are superimposed, making evaluation of either more difficult. It is routinely challenging to determine the evidential importance of either impression at this stage, and it is obviously desirable to optimize both to the degree possible for evaluation. 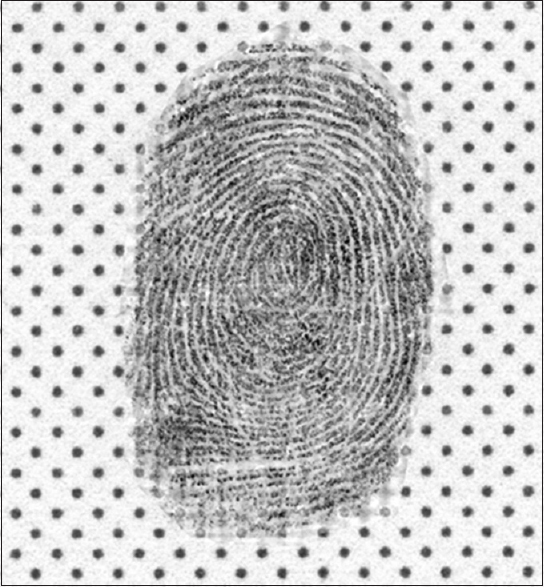 [Figure 8]a displays one fingerprint that has been superimposed on another, on white paper. 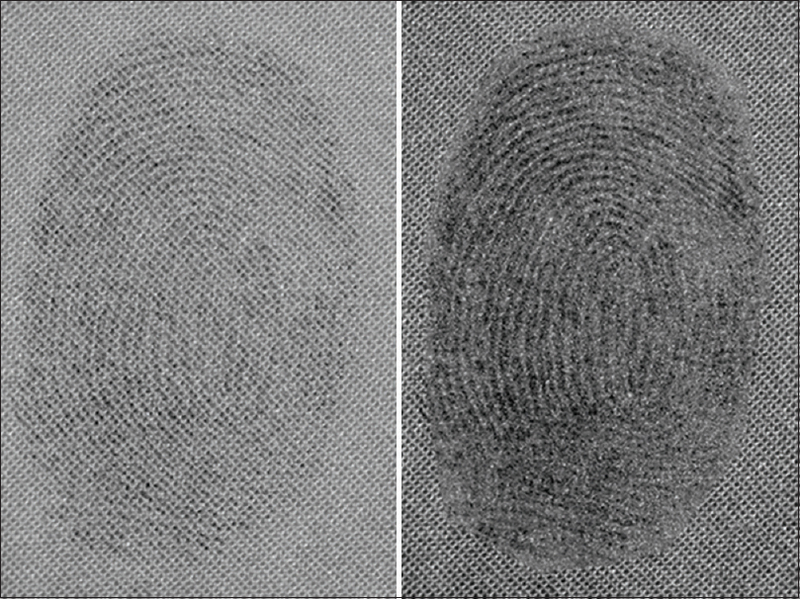 Both fingerprints are recorded in the same medium, black ink, and are of different digits from the same donor. Consequently, their respective signatures in the frequency domain occupy the same location regarding distance from the center of the display, separated only by the direction of the ridge flow. When the entire image is transformed to the periodic display, the signatures are difficult to interpret and edit because the ridge flow of each fingerprint represents almost 360 degrees, although the parallel ridges are not necessarily in the same part of the image [Figure 8]b. Accurate interpretation and editing in the frequency domain are often easier if they are conducted in stages, one zone at a time. The zone in [Figure 9]a outlined in green reveals two groupings of spikes (signatures) in the periodic display [Figure 9]b, representing the two sets of ridges which are approximately at right angles to each other. As stated previously, recurring pattern elements in an image will generate signatures in the periodic display that are located at 90° to their direction in the image. 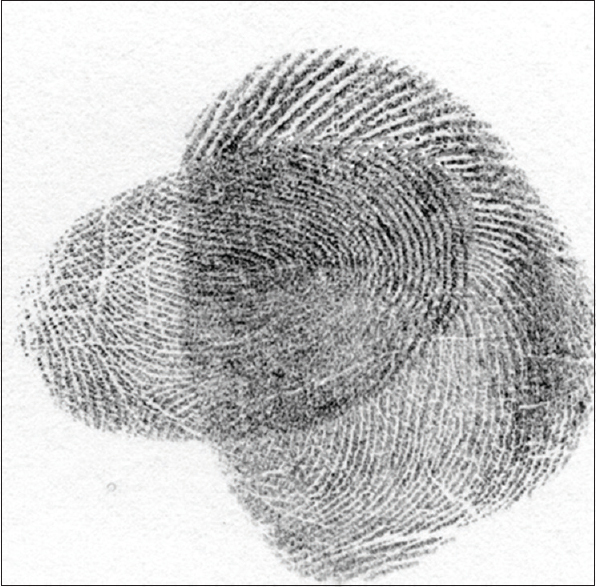 The horizontal fingerprint is first regarded as signal and the vertical one as noise. 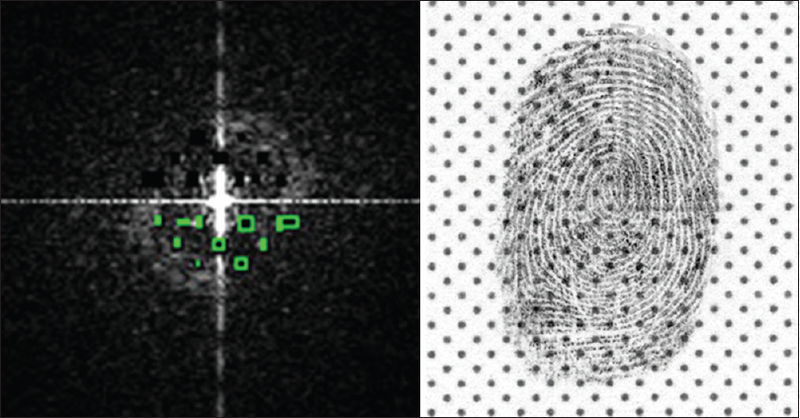 [Figure 10]a depicts the outlined signature in the periodic display for the ridges associated to the vertical fingerprint. [Figure 10]b reveals the result of editing this signature. The ridge detail associated to the horizontal fingerprint is now suppressed and the ridges of the horizontal impression are easier to analyze. The remainder of the horizontal fingerprint was divided into three additional zones and edited in a similar fashion [Figure 11]. It is important to overlap each new zone to include part of the preceding one, to ensure unbroken transition. The image of the superimposition was then reopened, and the vertical fingerprint was treated as signal. Similarly, the area of superimposition was divided and edited in four zones [Figure 12]. Joseph C. Unbaking a Cake – Fourier Series Transforms. Available from: https://www.youtube.com/watch?v=Qm84XIoTy0s. Olsen RD Sr. Scott's Fingerprint Mechanics. Springfield, IL: CC. Thomas Publisher; 1978. p. 429-35. Dalrymple B, Smith J. Forensic Digital Image Processing: Optimization of Impression Evidence. Boca Raton, FL: CRC Press; 2018. p. 210-2. Watling WJ. Using the FFT in forensic digital image enhancement. J Forensic Identif 1993;43:573-53. Kaymaz E, Mitra S. A novel approach to Fourier spectral enhancement of laser-luminescent fingerprint images. J Forensic Sci 1993;38:530-41. Dalrymple BE, Menzies T. Computer enhsancement of evidence through background noise suppressionl. Forensic Sci 1994;39:537-46. Dalrymple B, Smith J. Forensic Digital Image Processing: Optimization of Impression Evidence. Boca Raton, FL: CRC Press; 2018. p. 137-9.